What is a vector logo file? This is one of the questions that our customers struggle with everyday when they decide to personalize their packaging products. We would like to make the process of adding your logo to your packaging as painless and as easy as possible so will try to explain. 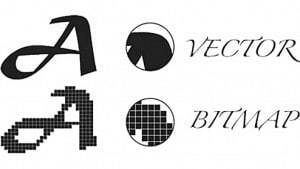 It was only 5 years ago I had no idea what a vector logo file was either, so I think I can explain it in simple terms that we can all understand. You normally get asked for a vector file when you are printing your logo onto packaging or business cards or any formal printing process. You may wonder what we are talking about when we say you need an .ai or .eps file and what is 300dpi? These are types of vector files, .ai is an Adobe illustrator file which is the program many graphic designer’s use when they make your logo, if created in this program your can be resized or altered easily. They can then save it as an .eps or a pdf file for you and this can then be opened up again in Adobe illustrator and edited or resized etc. Sometimes you may not be able to open some of the file types, but that is OK we can do that for you. When you are asked for a 300 dpi file this relates to the number of dots per inch that are in the file, 72 dpi is normally for web purposes only not print. I guess the easiest way to explain the different between a vector file and other files is that when you enlarge a vector file (so zoom in on it) it does not distort or blur, it doesn’t turn into a lot of little dots/pixels. A vector logo file stays the same when we enlarge it to suit your products therefore the print quality is superior and the outcome so much better. Sometimes your logo may have only been designed for the web, which means it’s a very small file and saved at a minimum resolution that will load quickly on your website or work as a watermark for your photos on your website or Facebook. You can’t make this file bigger once it has been saved and created at this small size. It also does not print well. If you have created your logo yourself in Photoshop or word or other programs you have available. We will try our best to work with you on this, if you let us know. 1. Make your logo at the largest size in centimeters that you can and save smaller ones for other uses. 4. Try to make sure your file is 300dpi or more. You can check this in Image size in Photoshop, you should do this from the start when you open the new file to make your creation. 5. If it all gets too hard we will do our best to help, however sometimes our graphic design service is the next best option to solve everything. At the end of the day we just want to create beautifully packaged products for your and your business and want it to be the best experience possible for you. We understand graphic design and files are a little tricky so please let us know if you have any questions or would like us to look at your logo with a product in mind. Here is a link to our website to browse our custom printed products. Please feel free to email our team at sales@bespokepackaging.biz, we look forward to helping you create an awesome packaging experience for your customers.